The main time span chosen focuses especially on 1982 through 2000, which reflects the main AIDS crisis years, and it is planned to expand the years covered in the future. 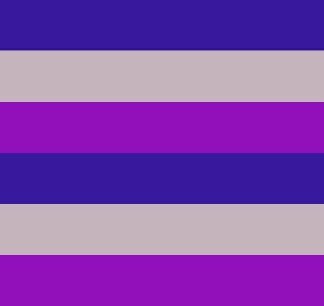 While the majority of individuals in the data base have died of AIDS, we do not intend to infer that to be the case if it is not mentioned in a specific listing, nor is the sexual orientation implied to be GLBT. 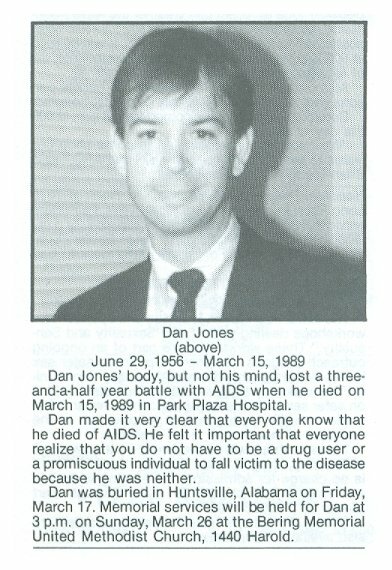 For many of the listings, the tag word "AIDS" has been added, so that the internal search engine can find it, but again, only for those listings that state the individual died of AIDS, or imply that by requesting donations be made to an AIDS organization. I am viewing this project as a number of phases, and phase 1 is all the data I can retrieve from This Week in Texas magazine (TWT) for 1982 through 2000. Next I will work toward expanding the years before and after this span, and already have a number of obituaries for early years. And, again, while I am not terming this as an "AIDS" database, realistically the bulk of it is. TWT stopped its initial run in August of 2000, and when it re-started in June of 2006 it featured almost no obituaries, either by policy or perhaps few were submitted. In later phases it is intended to add obituaries from other publications (Montrose Voice, New Voice, Texas Triangle, etc) when access is available. 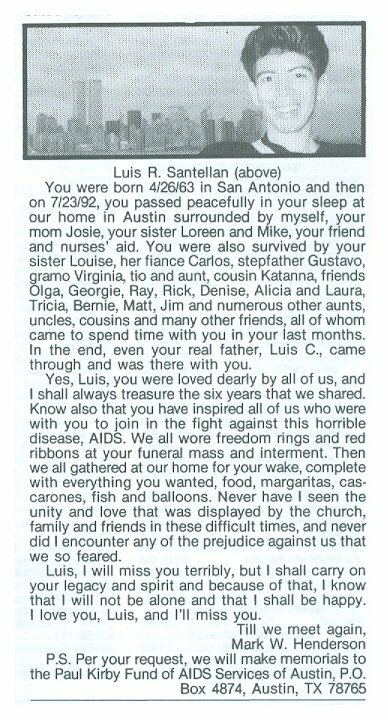 The magazine began in April 1975 and the first AIDS death in Texas was in March of 1982, with a total of ten by the end of the year. 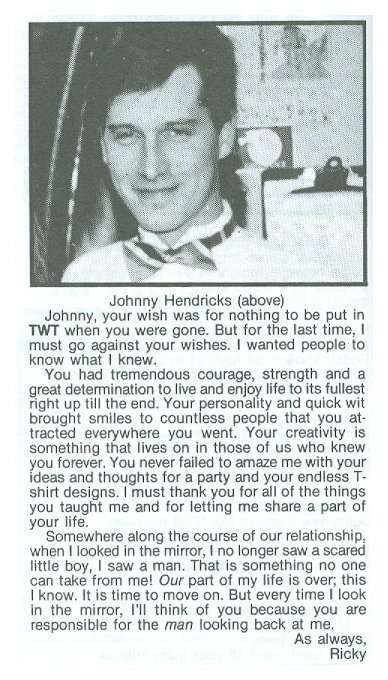 The numbers grew rapidly and in June of 1983 TWT began showing the obits in the back of the magazine. Prior to that, they were "news stories." In the early years almost all death mentions in TWT were the result of crimes, and for many of the victims there were not obituaries at all, just the news report of the event and sometimes the apprehension of the murderer by police. As data within scanned obituaries cannot be found by a search engine, I set up a page for each one and typed in text the information, at minimum the name, date of death, age and city. When this was not available I did internet searches to try to complete as much as possible, to make data searches more useful. Regarding the city of death, I tried to list the location they lived most recently prior to their death, rather than the location of their family where they went to live when they became too sick to care for themselves. That so many went "home" to die likely reduced the obituaries for many being submitted at all. Their family many states away would not know about TWT or other publications. Anyway, this is the minimum data I attempted. For many however, data was just not available, so I added requests to email me missing information. And, this is a mountain of data; I also want to know about errors. Also, I did not have access to the data in chronological order, so there are a number of duplicate entries for some individuals. 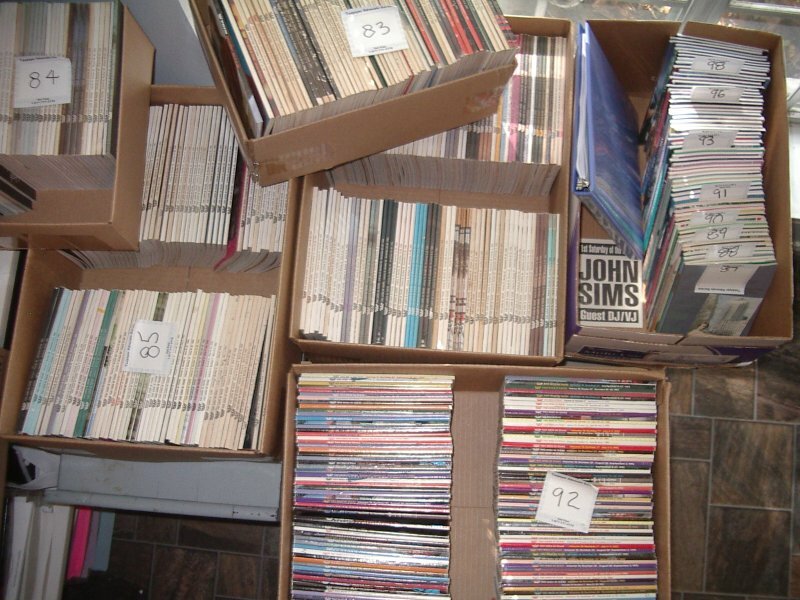 Please let me know if you find those so I can consolidate them. Special Comments on Tagging an obituary with "AIDS"
This is a grey area, to be sure, as not all obituaries give a cause of death, and I felt it was "not my call" to classify the cause without more to go on. I would do so though in several examples: if I had known the person and the cause, or had been told by someone who knew them well, or if there were other "clues" in the text that we in the community would recognize. This might be that they were in a particular hospice (known for treating AIDS patients) or where donations should be given, or lines like "thanks the nurses of the 8th floor of Park Plaza," in other words, the "AIDS floor." 1. In the earlier days of the epidemic, it was referred to as a cancer. Hence some of the obituaries may say the person died of cancer. 2. Some people could not come to terms with the disease even to call it by name for what it was. 3. There was a stigma attached and some people could not bring themselves to admit what it was, so they called it something else. 4. Some people were just coming to terms finding out that their child was gay, let alone that they may have died of this mysterious cancer/disease that no one could figure out or understand. 5. Also to deal with it in terms of people finding out was hard. People were afraid of being judged by their religion or church. Or they were afraid of how they would be looked at. That their child was a sinner, etc. This could happen even if religion was not involved, due to the stigma. 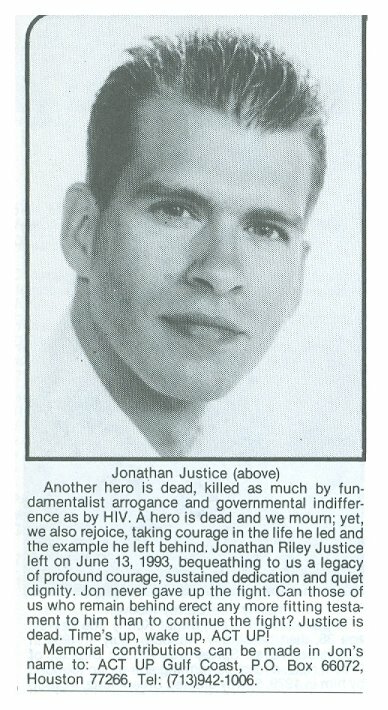 One obit stands out displaying this fear even though in this case it was not an AIDS death. 6. 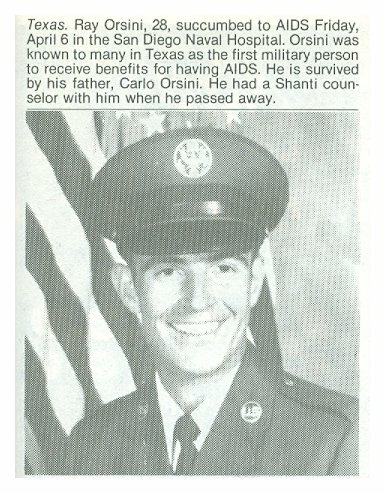 Therefore there were all kinds of reasons that many of these obituaries might not being labeled as aids related; even though many of them probably were. I have nothing but a gut feeling to back this up, but I would speculate that the AIDS totals, if truth be known, would be double what they actually show. The data you find at any time is all the data I have, so if an obituary for your friend/lover/etc is not in the data base, it could be there was not one submitted. If you can send me a scan of one (from any source, any year) I would be glad add it. Remember, these are mainly just the obits given to TWT, and a few other publications. Many obits were simply not submitted, for a variety of reasons. For example, especially in the early years there was a stigma about dying of AIDS, or even in some families about being gay, or perhaps some did not know the gay publications existed. The data in these publications were unique in our history for an interesting reason. 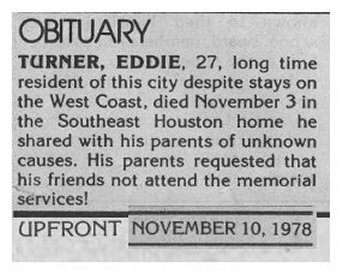 This is likely the first time that obituaries were placed not by the person's family but by their friends and lovers. This would be a quick explanation for the presence of so many drag performers dressed in drag in the obit photo. Few families would even consider that option, while a person's gay family would know the person's preferences. The internal search engine is precise, so if you are searching for "Ken West" you will get different results than for "Kenneth West," so also try variations of someone's name. You can also search for data on a more global basis, such as entering "AIDS" and "Dallas" will yield the number of obits from AIDS in that city. 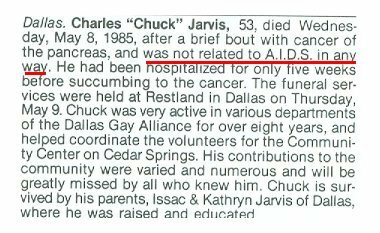 Again, I only inserted into the text the word "AIDS" if mentioned in the obit or if it suggested donations to an AIDS charity or hospice. I realize that many more died of that cause without it being mentioned, perhaps by my estimate 50% more of the overall data. There are some "category" tags hopefully useful to researchers, like "black," "latino," "female," "violence," "drag," etc. A comment about that data: to face reality TWT was a gay male publication, and mostly a gay white male one. To search on "black" and get such a tiny number of matches is not credible. Of course black people got AIDS. 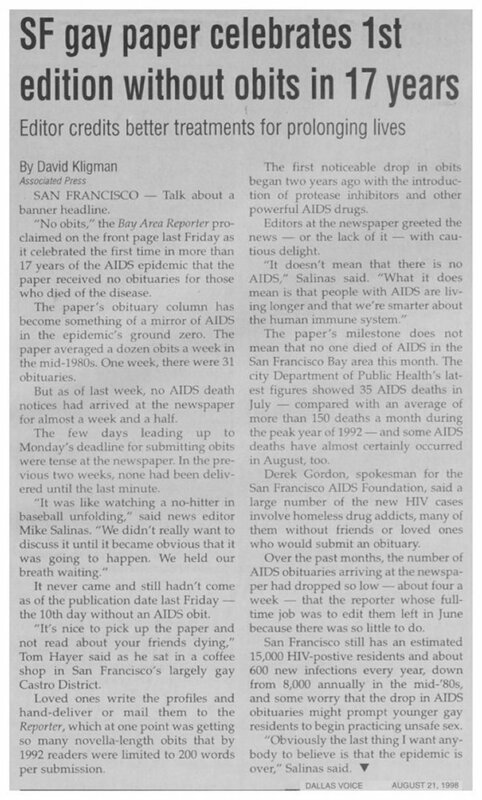 An explanation is that perhaps that community did not feel a connection to the publication, or culturally there were greater stigmas to "admit" dying of AIDS or even being gay (and of course straight people had the virus). (Naturally, I could only add a "black" tag if there was a photo to go by. Photos are present in roughly three fourths of the obituaries). Data for Hispanic people are much more present, though also not in the proportion you would think reasonable. Women? Again, there is only a tiny number. From this database one might think every lesbian is still alive. 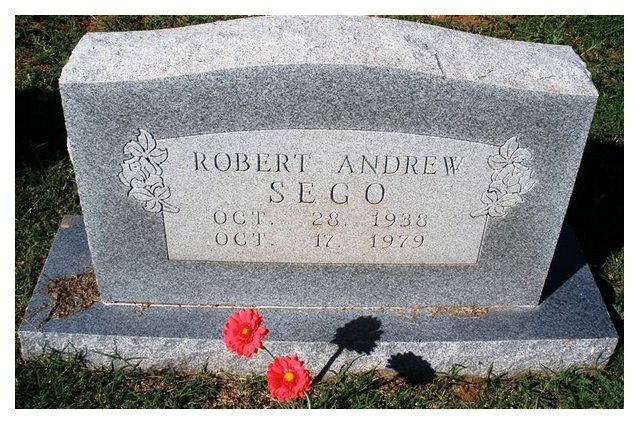 When the obituary provided the information (and few did) I have tried to enter the full name of a person's partner, whether pre-deceasing or surviving. So, if you know the name of someone and cannot think of the late partner's name, try searching for the other name. Of course if the obit just said something like "survived by Randy," that data would not be meaningful and was not entered. Also, when data relevant to a person's social or business life was provided I would often enter it. Such as, if they were manager of a particular gay bar, or a member of a gay chorus or social or sports group, those words can be searched. 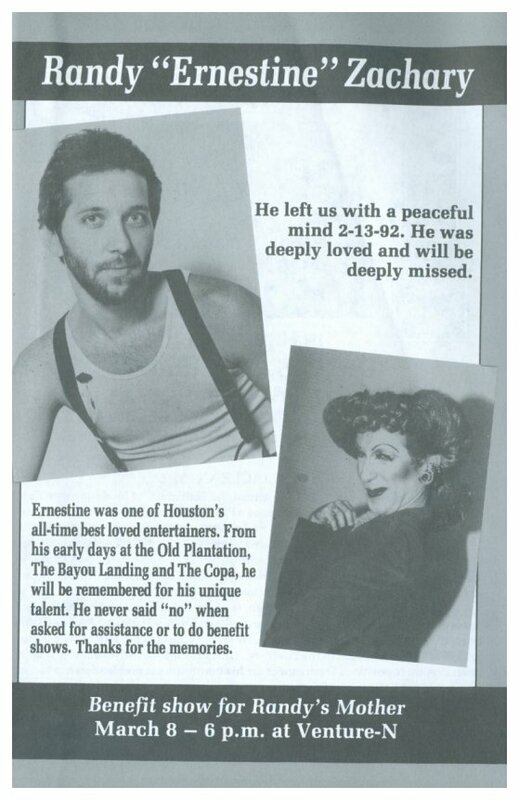 A side comment, I have a listing from 1999 of deceased members of the Gay Men's Chorus of Houston (from a performance program) and less than half have obituaries that I found. So, there's a lot of missing data. I do not encourage many "conclusions" using the data, given the already mentioned unknown areas of the number of obits submitted versus the unknown "real" totals. But you can certainly see the trends of 1989 through 1995 being the peak years and then the data starting to fall around 1996, coinciding with the use of protease inhibitors. newspaper, resulting in their suicide. This is a real example.